At times I get these urges to make dosas. My favorite is masala dosa but since its heavy and I am trying very hard to cut down on carbohydrates I will have to settle for a plain dosas. However, I still wanted to do something special and make this a little more exciting. What do I do? I made some tomato chutney. I hope you will enjoy it. You can use this as a dip or on dosas. What if we use simpel canola oil instead of gingelli oil. Great color CC..Love to have it with dosas or even rice..Amazing pics as ALWAYS!! WOW..tomato chuntey with dosa sounds del-lish...wanted to have some now...yummy! Wow!!! looks soo spicy , yummy and delicious. Rocking pic..
Amazingly delicious... love it !!! 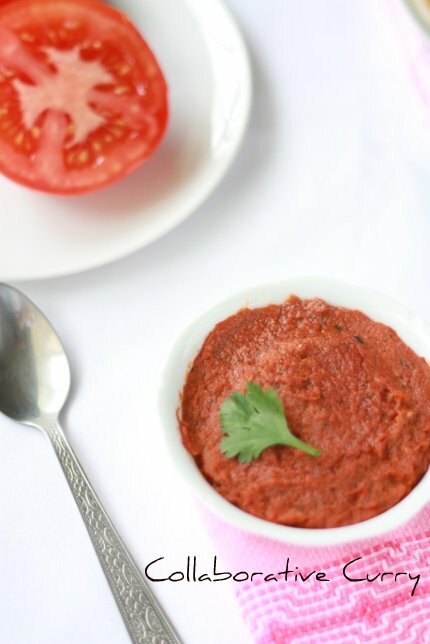 tomato chutney enhances the taste of a plain dosa.. and a spicy change too! lovely colour! I love this too! Yummy! Great with Chapatis too, good looking Tomato chutney there, love the garlic addition too. Excellent!!! perfect for hot dosa, ildis and rice. 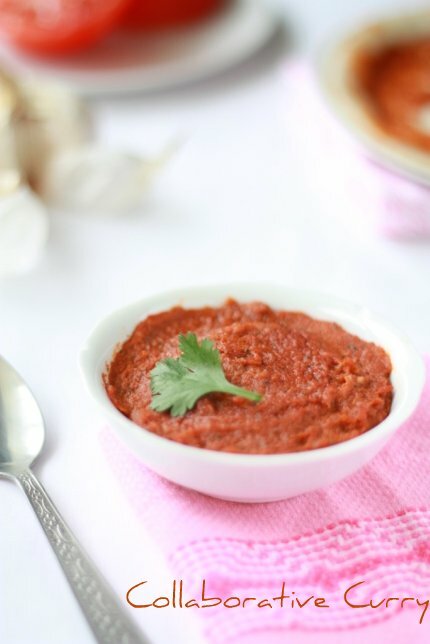 Super tomato chutney Sunitha...its beautiful color makes the dish very tempting...great. Tomato chutney looks really yummy. Nice to have with dosa. Looks very delicious and yet easy to make. I would like to have some dosas with this beautiful chutney...wat a droolworthy chutney..
wow ... very new. I would love to try this in my kitchen soon. Do you know how to make tomato pickle by any chance? The pict makes me hungry, the color is perfect! Lovely vibrant tomato chutney. Nice sides for Idli and Dosa! One of my favourite chutney :) Looks great! I am a really big fan of your pictures. It just makes the dish look even more tempting. Love the color of the chutney. Colourful and tempting chutney ..and love the pics...the pics make me drool . Colorful and yummy chutney! Love it with dosa and idli..
Looks yummylicious! How do you manage such great clicks? Both of you? Are you both located nearby? This looks beautiful and delicious. I have never tried to make chutney but I love it. I will have to give it a try. Thanks. Hey using dal in tomato chutney new to me...worth trying. stunning ruby red chutney. love tomatoes in any form and with dosa this would be sensational. Hi. Lovely colour, I add fenugreek seeds too in my version. kidilam chutney... love the color and as always the clicks! The chutney looks delicious, lovely red colour. The chutney is tangy and spicy! I'm dying to taste it! Woooow my faaaav tomato chutney dear taste good with idli,,,ur's looks colourful n delicious.. It looks so beautiful. I think it's really just perfect for dosa dip. I've never tried making a chutney before-thanks for sharing! This chutney must really go well with the dosai. Looks really tasty! Lovely Blog and recepies! will drop by again. Will try the tomatoe chutney! 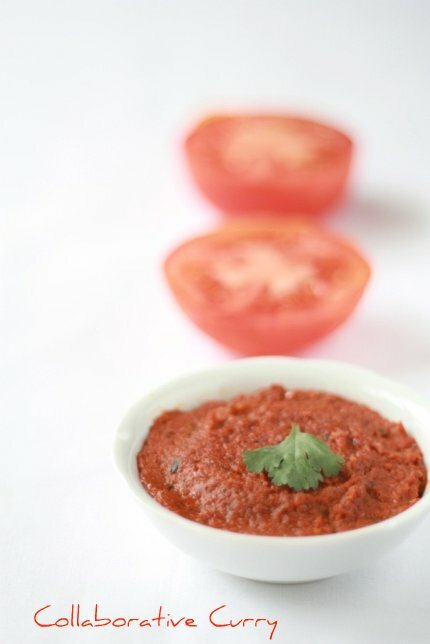 you know i have been looking for a long time for an authentic tomato chutney recipe (it wasnt made at my house growing up) and i think i just found one. thanks for sharing this! This chutney is my fav. I love to have with idli. Nice wonderful clicks.